It will be 63 years come Monday. They weren’t the only ones working on the issue, and their work has been criticized for not adequately crediting the foundation laid by British biophysicist Rosalind Franklin,2 but they’re the ones who published it and, with Maurice Wilkins, were later awarded the Nobel Prize for its discovery. And we can get into the act ourselves by getting our own — or a cousin’s — DNA tested — with a discount from at least two of the DNA testing companies in their annual DNA Day sales. You’ll have to wait to place your order until close to the end of the business day for Family Tree DNA, but it’ll be worth the wait. The sale there will feature savings on autosomal testing (the Family Finder test), on mitochondrial DNA (mtDNA) testing and on YDNA tests at several levels. These are only for new tests and add-ons; upgrades to existing tests may be discounted later this year. And remember: you may need to wait until this afternoon to see these prices on the website! At AncestryDNA, for US testers, the usual price of $99 for an autosomal DNA kit has been reduced to $79 until 11:59 p.m. Tuesday, April 26th. Shipping is extra. As usual, I can’t figure out how to convince Ancestry’s web servers not to automatically insist that I access through the .com site instead of the international sites, so I can’t tell if there’s a sale on for international customers. No excuses now. With sales in effect, it’s time and more than time to get our own — or that cousin’s! — DNA tested. Thanks for the info on the sale. Price in Canada for ancestry dna test is $109Cdn ($40 discount), which is fairly close to what you would pay to convert the $79US. Thanks for posting that, Lori! I can’t figure out how to make Ancestry let me look at the international websites. I just checked the 23andMe website and saw the price as $199. I have a friend from Vietnam who is interested in doing a DNA test, but finds that price too high. Do you think the 23andMe test is still the best DNA test for determining more precise ethnicity for Asian American and also a better chance for finding “cousins”? Someone I know who was adopted from Vietnam did his test through 23andMe and found that he’s about half Chinese as well as about half Southeast Asia. A person from Korea had mixed Korean and Japanese ethnicity come up in her 23andMe results. From what I read about these tests about two years ago, Ancestry wasn’t able to give results that precise for those of Asian ethnicity. Do you know if Ancestry is able to be more precise now? The lower price on the Ancestry tests is tempting. Yeah, sigh… it appears that different prices appear depending on which site you look at (post now corrected). The $149 price shows up on the international page (https://www.23andme.com/en-int/) but the US page is showing $199 (https://www.23andme.com/). I do think 23andMe has the best overall ethnicity estimates still, but the price is awfully high… and it’s hard to recommend it while it’s still in a state of flux over its transition from pre-FDA days to today. Is the Family Finder test of Family Tree DNA similar to the autosomal DNA kit of AncestryDNA? If so, what, if any, are the differences? Are there other autosomal DNA tests that look for more matches that aren’t on sale that I should consider? Just trying to decide what test or tests I should do, for the first time. It seems that once Ancestry.com is in your browser history or cache, it will override any other Ancestry URL you enter manually and take you directly to Ancestry.com instead. In order to get back to Ancestry.uk, you will have to first empty the cache and browers history and then manually enter the ancestry.uk URL. We (Mom and I share an account/email) received an offer of $149 plus shipping from 23andMe. Maximum of 3 kits and non transferable. We are on the US site. I just received that email as well. But, sigh, it also says: “We are still preparing your account for migration to the new 23andMe experience, and will be providing more information, including timing, within the next few weeks. Please note that customers ordering today will receive a different experience than the one you are currently on, so you will not be able to share data with new users at this time.” Um… no. Fix it first, then we’ll talk about doing more tests. My father died in 2006. He was adopted in 1946, but we have no other information because it was handled privately. His adoptive parents didnt disclose many details. I’m his only child, a daughter. Can a DNA test help me find our bio family, as well as our ethnicity? Which do you recommend? There aren’t any guarantees, but a DNA test could lead you to biological relatives who will be able to help you identify your father’s parents, yes. Many people have used DNA just this way. On the TLC program “Long Lost Family,” they have used autosomal DNA testing to identify relatives for female adoptees. That program advertises that it is looking for subjects for future episodes, so you might want to see if they would accept you as a subject. Judy, once again Ancestry treats its clients Down under with contempt…our price remains unchanged at $A149 plus shipping. Grrr!! 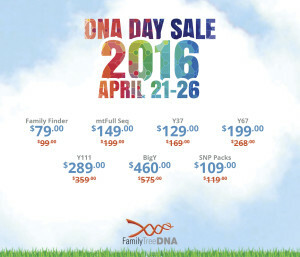 FAmily Tree DNA, however, IS offering a sale price which, with postage comes out at $A118. Guess which company will get my business?! What is the total cost of using Ancestry DNA? It just feels like there are hidden costs. Do you know if you can do gifts for other people? The total cost to get all of the possible benefit is the price of the test kit plus an Ancestry subscription. If you’re already a subscriber, there’s no additional cost. If you’re not a subscriber you can get the least expensive Insights subscription for $49 a year (available only by calling member services).